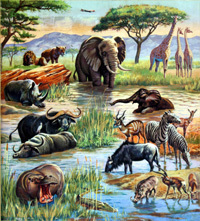 This original painting of an African Water Hole was used in Look and Learn #957, 12th July 1980. 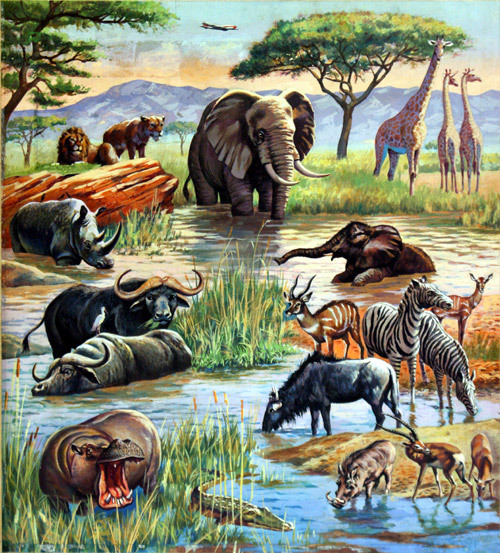 It features Lions, Elephants, Giraffes, Rhinoceros, Hippopotamus, Wildebeest, Warthog, Crocodile, Kudu, Grant's Gazelle, African Buffalo and Cattle egret. Not all animals would be seen at a water hole at the same time due to the danger of attack from the carnivores. The illustration seems to have been used also for an earlier children's book date and title unknown but possibly 1960s.